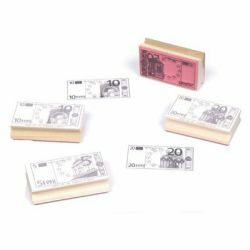 Catalog Home > Center Enterprises > "EURO BILLS STAMPS-5,10,20,50"
Make crisp, clear images of 5, 10, 20 and 50 Euro bills. Use this four piece set to create your own money, activities and games. Each stamp is approximately 1 3/4" x 3".